After working for more than 20 years as a Certified Public Accountant (CPA), and in various capacities as a mortgage professional, I have concluded that the methods people employ in their financial endeavors determine their ultimate success in life. I also know that succeeding financially requires a commitment to do your best and to surround yourself with professionals that add value and help define realistic and well-established goals and objectives. You must manage your money proactively and implement a financial plan as soon as you have some level of maturity—and every good financial plan is built around a mortgage. In this book, I will not only show you some amazing facts about how you can manage your mortgage to reach financial independence, but I will also take you on a journey. When we finish this journey, you will have learned all the critical facts about mortgages: how to acquire them, how to manage them, and which one is best for your needs. I can also guarantee that during our journey together you will gain new insights into the mortgage process. In so doing, you will come to recognize and understand financial opportunities that you never knew existed, and you will see these opportunities as valuable enough to inspire what I call an “aha!” moment, which takes place when you recognize a tremendous opportunity that will bring you significant financial gain. Possibly you might experience such a moment while walking along the beach when, looking down, you spot a gold nugget lying in the sand. The methods I will outline herein, when properly employed, will allow you to accomplish not only financial success, but also success in life more generally. As I embark on my 70th year, I realize I have learned from the many mistakes I made in life, and I have paid a price for this knowledge. Now I wish to share. I will convey this information in a simple, easy-to-follow format, and in so doing, save you all the time and energy I expended to gather and learn these valuable concepts. I will demonstrate how you can use this knowledge to capitalize on the financial opportunities I wish I had in my own life. For most people, life is a long, arduous journey with trials and pitfalls along the way. Many of us chase financial dreams that never materialize. Although many people believe that becoming rich is the key to achieving happiness, I have learned that true happiness revolves around five things: (1) self, (2) family, (3) business, (4) health, and finally (5) money. Life planning is a powerful process that embodies all of these elements. It has enabled me to focus on other things than just monetary gains, and it has helped me to develop as a person and to become a truly happy individual. When you recognize that ALL of these areas are important, rather than just money, you gain the focus and desire to achieve a solid end result. You may be surprised to find a book about mortgages that focuses more on non-financial topics that are not directly related to money. Well, we are going to deal with mortgage products in a way that will achieve the maximum possible growth for you and your family. We will discover how a mortgage is not only your most significant liability, but it can actually become an asset that will provide you with tremendous growth opportunities when managed properly. You will find the topics we cover both thought-provoking and rewarding; I assure you. You have probably never even considered the inherent wealth in a mortgage. Like a gold nugget lying in the sand at your feet, the hidden value in your mortgage sits untapped, lost in a clutter of paperwork in your file cabinet—and sadly, overlooked in the often-neglected records of your mortgage professional. In most cases, the wealth a mortgage holds has been mismanaged and disregarded. Its value for the most part is out of your reach, but armed with the knowledge I will convey in this book, all you will need to do is find the right mortgage professional and you can tap into that value. I will demonstrate how to use the equity in your home in ways that most people—notably, many mortgage professionals—don’t understand. Again, the desired end result is not to become rich but rather it is to achieve financial security. Will the methods I recommend require risk? I don’t think so, and I will show you that being progressive and organized and proactive will lead to a positive financial conclusion. A mortgage is not something that should sit idly by, a jumble of long-lost legal papers misplaced in a dusty file cabinet; rather, it should be a tool, a commodity that is actively managed and changed at will. Although this concept runs contrary to most contemporary thinking, you will come to think of mortgages in a different way. Fail to do so and you will miss a tremendous opportunity in life—and I have the numbers to prove it. As a result of the housing meltdown and recent regulations enacted to protect everyone, getting a mortgage is far more complicated now, but if you are qualified, and if you have a good team of mortgage professionals, you will get a mortgage. I will show you how to buy a home, even if you don’t have a large down payment, and how to take advantage of tax laws, all in a simple way. All I ask is that you remain open minded and that you consider my ideas thoughtfully and then implement them as you see fit in your own life. I will teach you about the various individuals involved in the mortgage process and how they can help you get a mortgage. As of this writing, some of these individuals are experiencing difficult times due to a reduced amount of business. The real estate market remains in recovery mode. As a result, the number of mortgage professionals has dropped since many have been forced out of business. Real estate attorneys have had to shift their focus to other legal undertakings. Today they are representing clients involved in short sales and foreclosures. Financial planners have also experienced a change: the recession has had a material effect on the assets held by their clients, so their fees have been reduced. Accountants as a group have not been significantly affected by the recession—in fact they may be prospering since many of their clients need advice on how to manage their businesses and money during these turbulent times. My goal in this book is to show you as simply as I can how to leverage the power of a mortgage to build financial success. I will teach you how to acquire a mortgage effectively and then how to employ it as a financial tool in a cohesive financial plan that will help you build and accumulate wealth—and ultimately live the best life you can. 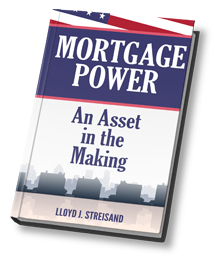 If you read and study the concepts in this book, you will gain a deeper understanding of the alternatives you have when selecting a mortgage product and the different methods to acquire it. You will learn to employ these methods to optimize your financial gains while living the best life you can live.